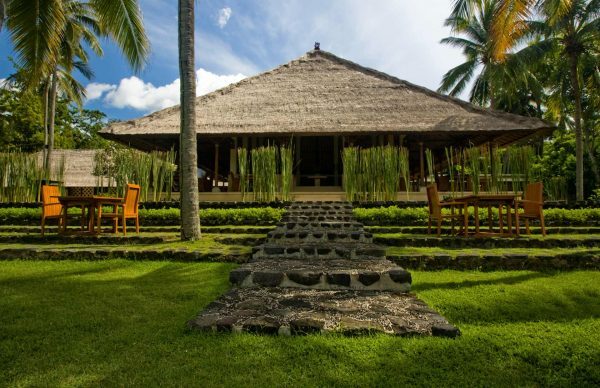 Exhibiting a traditional thatched serenity amidst the high peaks as well as soothing areas, Alila Manggis is an ocean-front treat in the canopy of the famous and believed to be sacred Mount Agung by the Balinese. Opulent yet modest, this Alila hotel in Bali, Indonesia has gained an international acclamation after it won an award for its cookery school. Further, it is interesting to know that this Alila hotel in Bali, Indonesia is a Green Globe certified inn that is just proud of its natural spa products as well as its own vegetable garden. 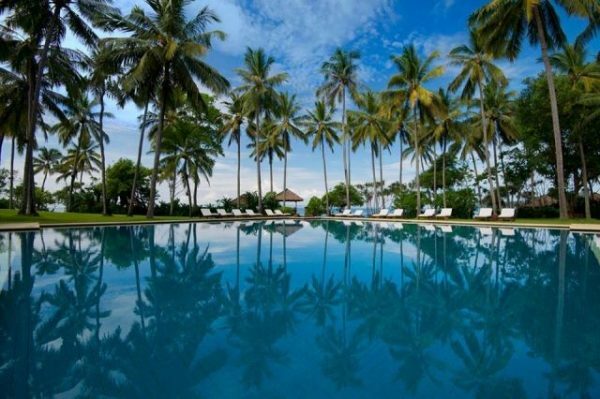 While staying in its soaring edifice amidst bountiful sunlight and lavish coconut groves, expect a rejuvenating natural spa and some exhilarating snorkeling on the pristine shore of East Bali. Speaking about the rooms in Alila Manggis, there are 54 in total all of which are split into three categories namely Superiors, Deluxes, and Suites. The rate doubles starting from $150. Among the amenities, you can expect spa, organic garden, pool, cookery classes, valet parking, WiFi, car as well as bike rental, boutique, laundry, and leisure concierge. Coming to the poolside of Alila Manggis, you can enjoy in its pyramid-style pool that is distinctly inverted. This unique water body features a profound centre, shallow edges flanking coconut palms of the landscaped gardens, and beautiful vistas of the ocean beyond. Looming over the hotel is the Bali’s holiest mountain, Agung. So, why not set free your inner disciple and be a part of the organized trek to be at the celebrated Beaskih temple? This trekking is organized by the hotel itself. The check-out time of this alila hotel is 12 pm. However, on your request and as per the availability of the rooms for the new guests, this deadline can be further extended up to 3 pm. You are free to bring children here although Alila Manggis does not offer any amenities specific for children. However, additional cots or beds are provided per night for US $30. You can also request for a child-specific breakfast and that even babysitting can be reserved for $5 per hour, but provided you book for it one day in advance. If want complete isolation without any kind of noise or disturbance, book the Seaside Corner Suites – 222 and 225. 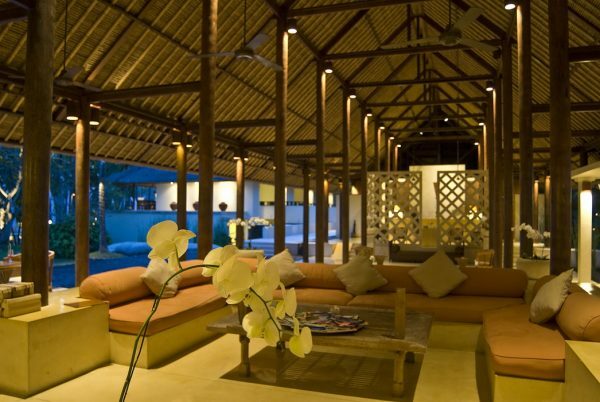 These are the suites that feature twisted balconies, chairs, and daybeds for calming down in the pleasant Balian air. In its only sole and admired restaurant, the Chef Penelope William is the most praised man to serve the dishes of the Modern Asian cuisine. Try out his ginger flower salad with the dressing of coconut while you are seated in a typical Balinese pavilion above a pond of lotus. Eager to know the best or the most apt dress code to match with the style and architecture of the restaurant? Well, this is informal. However, try out putting a hibiscus flower in your curled hair. 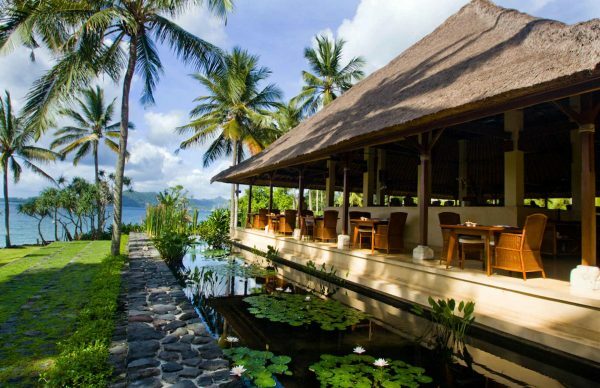 Want to know about the best table in this Alila hotel of Bali, Indonesia? Well, it is the table that needs to be arranged in the coconut grove. But, beware of a mosquito bite too. The restaurant will only serve you until 10 pm, while the room service is available for all 24 hours. There is no formal bar in Alila Manggis, but come to the lobby once and soak yourself in its tempting watermelon mojito. Winter Ski Resorts in San Diego? Are there All Inclusive Resorts in Puerto Rico? Luxury Resort Guide Copyright © 2019.